Earlier this month, we were invited to to take part in a a “Breakfast & Tweets” meetup at Hostal Sport in Falset, Priorat put together by two of the most active promoters of enotourism in the region: Hostal Sport owner, Marta Domènech and fellow wine writer, Ruth Troyano. Basically, they assembled a group of us who blog, tweet, and generally write about wine and/or travel to gather together and share a very proper Priorat breakfast (with wine, of course). 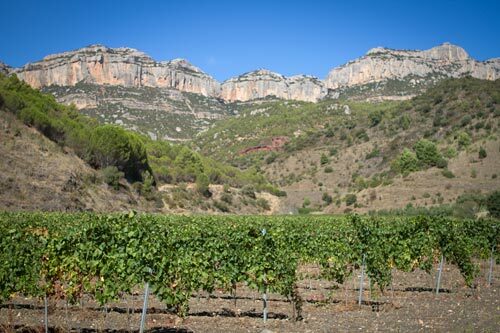 You see, the tradition in Priorat, as well as in rural Catalonia in general, is to eat an early meal that really sticks to the ribs so that you can go out in the fields, work all day, have a lighter lunch, and then come back home for dinner. 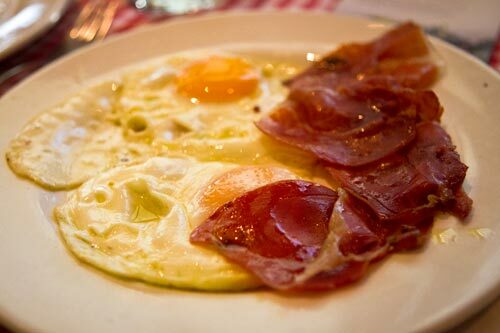 They call these traditional breakfasts ‘esmorzar de forquilla’, which means ‘breakfast with a fork’. 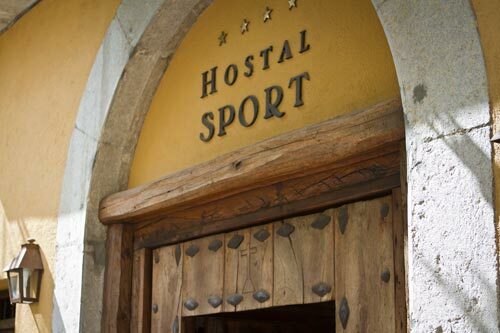 This one of the specialties of Hostal Sport in that they serve traditional, delicious dishes such as Priorat sausages with grilled tomatoes and black olives or fried cod with white “ganxet” beans. It’s quite hard to go wrong and no end of ways to go right when eating there. Even a vegetarian here in carnivore-centric Catalonia was able to get a wondrous plate of escalivada on rustic bread to start his day. And by the way, the wine they served was also excellent: Castell de Falset 2006, a blend of 50% Grenache and then equal parts Cabernet and old-vine Carignan, from the local cooperative in Falset (which is in an impressive well worth visiting). We had no field work in our plans for that Saturday, but a nice solid base such as the plates of jamón and eggs that we happily ingested created quite a wonderful foundation upon which to build a cellar visit and wine tasting up at Celler de Scala Dei afterwards. Breakfast ran a bit long as everyone got in to a lengthy debate about the best ways to promote enotourism online and really, what lay in the future of tourism for Catalonia. Obviously, that’s never going to be a settled issue as things change all the time and we eventually all packed in to our cars to drive up the mountain roads to the Scala Dei village that this famous winery calls home. The trip from Falset to Scala Dei is rather straightforward as you pass through Gratallops, la Vilella Baixa, and la Vilella Alta to get there (sidenote: stop and take photos if you have time). But, it’s that last stretch, as you wind along the canyon that a group of monks decided would make an awesome setting for a monastery about 800 years ago, where you think, “Crap, did I make a wrong turn?” The answer is a simple “no”, for there are no turns to make along this twisty road that shows the stunning panorama of stark, dramatic mountains that make up the Priorat. Eventually, Scala Dei comes in to view and we dipped down in to the village, parked and started the tour of the cellar. First, the winery’s official tour guide Ferran showed us how the cellar came to be and the history of the region which is fascinating and full of many centuries of drinking wine. Once we all took that in, we were led around by the cellar’s enolog, Ricard Rofes who showed us their grapes in the middle of primary fermentation as, despite it being the beginning of October, they had just started their harvest. 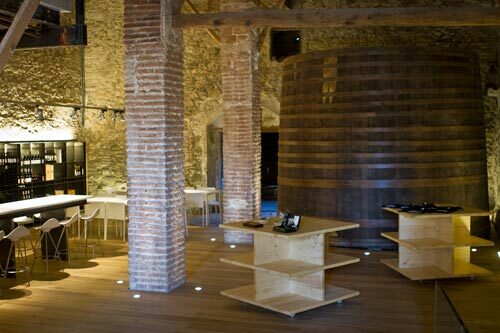 Once we saw how their wine came to be, we sat down in their quite comfortable, modern, and recently renovated tasting room to taste several of their wines including: Negre 2011, Prior 2009, and Cartoixa 2007. They’re a solid range of wines running from the Negre, which is good for everyday drinking (and what we felt was an excellent balance of price and quality for the region at 9€), to the Prior which shows class without breaking the bank, and then the Cartoixa, an elegant, aged bottle that shows why Priorat wines are held in such high regard with its deep body, elegant structure, and lingering finish. Of course, what do you do after taking in great wine? Well, most people sleep, but this wasn’t in the cards for us as we headed back down to Falset to have a three course lunch at Hostal Sport. As each plate arrived and was delicately shoved in to our happy mouths, it took us back to the last meal we had had on a previous visit that was no end of delicious. And of course, we had to close out a busy day with fantastic desserts like the pastry with strawberries and cream and the local cream specialty menjar blanc with nuts. Sure, one could have asked for a better day visiting a world class wine region, but one wouldn’t have found it.